The only way to get to Whittier is to drive through a one-lane railroad tunnel through the middle of a mountain. Nearly all of Whittier’s population lives in this 14-story building. When Pastor Kevin Jones got a call from God to become a missionary, a friend suggested he go to Alaska. "Alaska is quite an unevangelized state," he explains. Pastor Kevin is a Southern Baptist, but most of his parishioners are Catholic immigrants from the Pacific Islands. Still, he has convinced some of them to be baptized again; the harbor is too cold, so he sets up a large inflatable pool in the middle of the church room. Luckily there is a drain in the middle of the floor, because church is held in the basement of Begich Towers. After a drug bust on the 10th floor of Begich Towers, the Whittier Police donated a hydroponic garden to the kids at Whittier School. Joey Lipscomb, an eighth grader, runs the garden. He and the other students sell their vegetables in the lobby of Begich Towers. In the darkest days of winter you can sometimes find teachers in the garden, sitting underneath the natural spectrum grow lights. June Miller runs June's Whittier Condo Suites, a bed and breakfast on the fourteenth and fifteenth floors of Begich Towers. Like everyone who lives on the harbor-facing side of Begich Towers, June keeps a pair of binoculars on her windowsill. In the summertime you can look out and see whales breaching in the harbor, or mountain goats grazing on the slopes across the water, but mostly people use binoculars to spy on their neighbors. "These are for finding out if your husband's at the bar!" Mayor Lester Lunceford recently moved from Whittier to Anchorage; his is a part-time, unpaid position, so he commutes into town when he can. Whittier operates under a city manager form of government, which means that the mayor serves mainly as a figurehead. During his tenure, Lester has been interested in gaining exposure for Whittier and really putting it on the map; he has recently been in talks with two reality television production companies and the producers of a Gerard Butler submarine movie. Because the weather in Whittier can be so brutal, the school is connected to Begich Towers by underground tunnel, and the only playground is indoors. Dave Schofield is the chief of police in Whittier. He is also the only officer who lives in town. Alaska's laws often reflect the needs of a sparsely populated state, which presents challenges for policing within Begich Towers. For example, the state constitution has written into it a right to privacy; if something is occurring in your own home, you have the right to keep it private. This means that although there is a pervasive smell of marijuana in Begich Towers, the police can do little about it. "The law says you can't have drugs within 500 feet of a school; there's not a unit in this building that's 500 feet from the school, but we have the right-to-privacy issue." Dr. Michael Costa is a visiting dentist who spends nearly half his year traveling between Alaskan villages, and Erik Linduska is a dental health aide therapist based out of King Cove. Because villages in remote areas may go many months without a visit from an itinerant dentist, the Alaska Native Tribal Health Consortium has started a dental health aide program--the first of its kind in the United States. Dental health aides spend two years learning basic dental care, and are then stationed in a remote community; they offer preventative services and perform basic procedures like fillings and extractions, so that when the dentist comes to town he can focus on more complex dental problems. Ed Hedges lives year-round on a 28-foot sailboat with his cat, Whatever. In the winter he keeps warm with space heaters and staves off boredom by watching movies and reading books on his iPad. (Not only do books take up a lot of space, but they have a tendency to mold on boats.) When Ed first moved to Whittier he was living on a 32-foot bayliner, but it was difficult to heat such a large boat, and besides, he was told the waitlist for a berth that would accommodate a boat that size would be 15 years. Whittier Harbor, which never freezes, is one of the most desired in the area. The waitlist is often 10-20 years. While following the Rolling Stones across the country during their 1972 tour, Jim Bell found a discarded cardboard sign on the side of the road that read: “ALASKA.” On a whim he picked it up and stuck his thumb out. He’s been here ever since. Jim carves figures of Alaskan animals out of native Alaskan ivory. He wastes as little as possible, letting the shape of the ivory define what he makes. Jim's studio is located in Whittier Manor, the only other residential building in Whittier besides Begich Towers. Less than ten percent of Whittier's population lives there. The Pre-K through 12th grade student population of Whittier Community School typically ranges from 30-40 students. Lucky Medez, who moved to Whittier from Guam in her junior year, is one of three students in her graduating class. She misses being at a school with sports teams, dance classes, and proms. She'd like to move to Anchorage, but her teachers don't want her family to leave, because to lose Lucky and her five siblings would be disruptive in such a small school. "In Guam I used to sneak out of the house, so my dad moved us to the perfect place: the tunnel closes at night, so there's nowhere to sneak out to." Whittier has a city manager style of government, which means that the mayor mainly serves as a figurehead, and the city manager, who is not elected but hired, is in charge of all the municipal operations. Bob Prunella was brought to Whittier as an interim city manager, but he's now stayed here for two years. People in Whittier refer to Bob as something called "old Alaska"--he settled in a pre-pipeline Wrangle during Alaska's Wild West days. "I can remember the old tough Alaskan style, you party all night till five in the morning, and then you went to the cannery at seven to start pitching fish. We were tough in those days." In December of 2012 we traveled to Whittier, Alaska, a town where nearly everyone lives in the same building. The fourteen-story high-rise—called Begich Towers, or BTI—contains a post office, a police station, a grocery store, a Laundromat, a health clinic, and a church. (There once was a combination video rental store and tanning salon, but it’s been closed for a while now.) Built by the US Army in the 1950s, BTI originally housed officers and their families, and though its concrete walls have since been given a cheerful paint job, the fortress-like, institutional feel remains. The first thing we noticed when we arrived in Whittier was the wind—we were barely out of the car when a powerful gust pushed us down the hill. People in Whittier get out of their cars carefully; the wind has been known to shatter windshields and bend car doors backwards. Because the weather can be so extreme, kids often walk to school via an underground tunnel. The town averages around 250 inches of snow annually, but some recent years have seen closer to 400 inches. Two winters ago the snowdrifts near Whittier School were piled so high that the principal let students go outside to take pictures of one another hanging from a street lamp. When the Army pulled out of Whittier in 1960, the handful of remaining residents turned BTI into a condo, but the Buckner Building was simply abandoned. Too costly and dangerous to demolish, the building is still there today. Enormous, spooky, mazelike, full of beer cans and debris, the Buckner building is catnip for teenagers, graffiti artists, “urban explorers,” and photographers. But it poses such a liability hazard that the city finally put a fence around it last fall. BTI is beginning to show its age. Part of the heating system has been replaced. The plumbing system is certainly overworked. A few years ago, a pot grower on the 10th floor had just finished a harvest and decided to get rid of some of the evidence by flushing it down the toilet. In the process he stopped up the plumbing on the floors below him—a neighbor called city management to complain that someone had flushed large amounts of dog food down the toilets, but it turned out to be pellets of grow medium. Though Begich Towers and the Buckner Building provide much of Whittier’s intrigue, they aren’t the only structures in town. A handful of single-story industrial and municipal buildings sit between BTI and the harbor. The shore is lined with small stores that open up during tourist season. The Anchor Inn, a combination hotel, bar, and restaurant—the only bar or restaurant open year-round—is a five-minute walk from BTI. A small percentage of the population lives in Whittier Manor, a low-rise condo that overlooks the clanking rail yard, and a couple of people live on their boats year round. 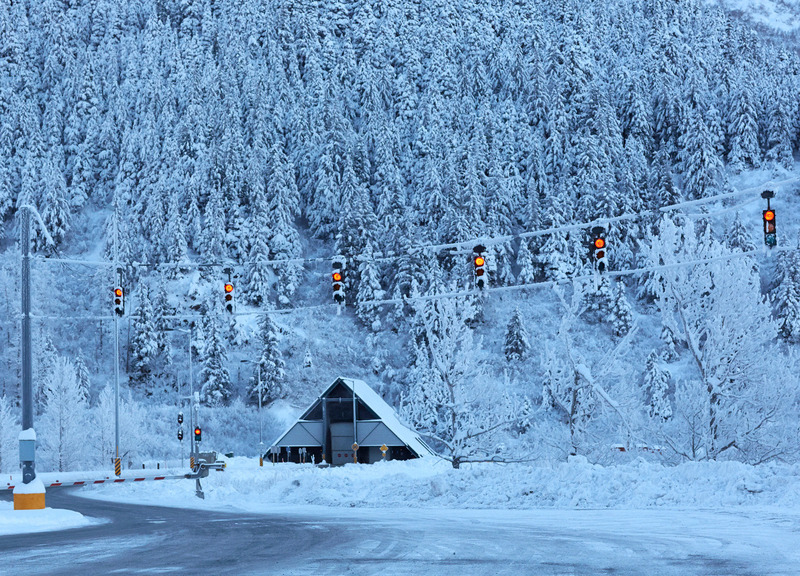 Outsiders have called Whittier the strangest town in Alaska. And it is strange: residents wander through the halls of BTI in pajamas; there is a provision on “fish slime” in the condo association guidelines; a pair of reindeer lives in a pen out front. Behind Whittier’s everyday peculiarities is a community thoroughly circumscribed by geography, architecture, and weather. But it’s also a friendly town in a spectacularly beautiful location. Some people manage to carve out comfortable lives for themselves within this extreme environment, and looking out over Whittier harbor at dawn, or on a snowy day while a neighbor fed the fat crows perched on his windowsill, it wasn’t so hard to imagine why someone might choose the limitations of a place like Whittier over the limitations of life in a big city down in the Lower 48.